The busiest shopping day of the year is approaching. 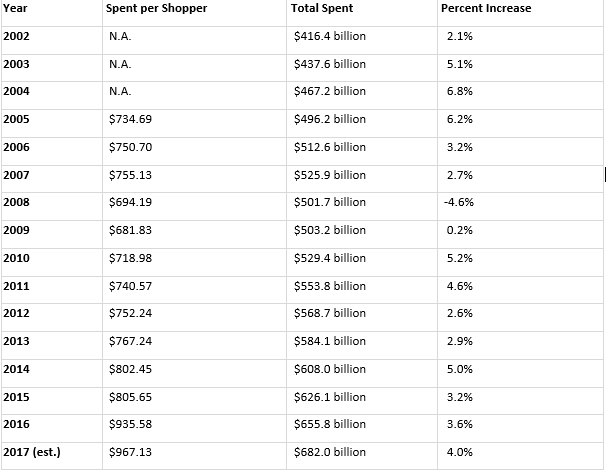 Have you ever wondered what Americans spend on Black Friday? The National Retail Federation estimates that each shopper with spend an average of $967 this year. Of course, take that with a little grain of salt — the NRF promotes shopping after all — but there’s no doubt that Black Friday is usually a huge shopping day. According to thebalance.com, the holiday shopping season is crucial for the economy because around 30 percent of annual retail sales occur between Black Friday and Christmas. For retailers like jewelers, it’s even higher – almost 40 percent. On Black Friday, 101.7 million shopped in 2016. That’s more than the 74 million in 2015. The next biggest day was Saturday, when 64 million people went to stores. Only 33 million shopped on Sunday. The grand total of 137 million people went to stores over the four-day Black Friday weekend. That’s a third more than the 102 million in 2015. If you’re planning on participating in Black Friday 2017, try to be cautious about what you need to spend vs. what you want to spend. Prioritize your shopping items and try to bargain hunt for the best deal. After all, Black Friday is all about savings. However, if you do find yourself waking up the day after Black Friday with a wicked spending hangover, we offer debt consolidation loans that might be able to help put your mind at ease this season. Good luck! May the odds be ever in your favor this Black Friday.